"She looked once more at the dreaded river. Since Anna's death, it had been such a barrier...a place and a moment she could not seem to move past. We begin with the mystery of Anna’s drowning and want to know why Tilly is feeling so much guilt towards her baby sister’s death, which creates interest and makes us want to read more. In The River, we are brought to the amish people of Eden Valley, which is different from some of Lewis’ previous works, and we get to meet new people. Just when Tilly and Ruth think they’re done with the Amish life, they’re thrown back to the past and must learn how to make amends with the people they left behind, and truly find themselves. I have read quite a few of Beverly Lewis’ works, and I must say that this does not seem like her best. It feels like it was a short story, with tons of fluff filler just to make it into a novel. A lot of times, it felt repetitive and even in the most crucial bits (like Tilly’s Mom’s big secret,) it was rushed. Literally, the secret came out in one quick sentence. I had to re-read it several times to make sure I read it right. 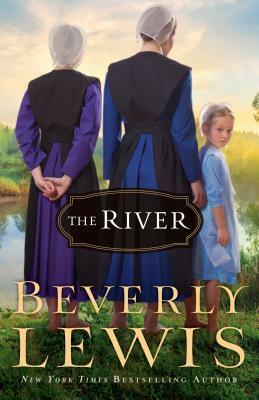 Being used to Beverly Lewis’ writing style, I expected something out of the blue to happen, such as maybe little Anna didn’t drown and was found and raised by Englishers. I felt tense the entire time I was reading this book (which I’ve come to see as good,) because it wasn’t the suspense that kept the book’s tempo, but the tension between Tilly and those she left behind, especially her father. I was grateful for this tension because it was the only thing that kept my interest. Perhaps the author is getting too pez-dispenser-like, and needs to show down and dedicate more time on each book so they can retain a soul. I don’t even know how many books she’s released this year so far, but I know it’s a lot because I’ve read them all. Lewis is my favorite Amish fiction author, so it would be frustrating for me to lose interest in her future works. I’ll definitely keep an open mind, though, and most likely read her next book to hopefully lift my expectations.